Bon Iver fans can be forgiven for a little worry. Who wouldn’t be concerned? Songwriter Justin Vernon left behind his Wisconsin cabin to go play with Kanye and AutoTune. He’s been on Letterman and Austin City Limits, and his debut For Emma, Forever Ago landed on everybody’s top ten list. And he went from hanging out in the Badger State backwoods to playing stages to adoring audiences all over the world. Would all the accolades and attention go to his head and make him forget what was so great about For Emma in the first place? It’s dangerous territory. This same, second-record stuff has tripped up so many who came before. And you’d think the heights reached by For Emma would make Vernon a candidate for a serious tumble. He’s a guy, remember, who woodshedded his debut, producing it himself with simple tools in simple surroundings. Now, he’s on regular rotation on “Chuck” and “Grey’s Anatomy” and hanging with the biggest rapper in the world and telling Rolling Stone he forgot how to write songs and “brought in a lot of people” to change his authorial voice. Egads. Sounds bad. That’s the voice we all loved. So, could he do it? Could he make a sophomore album without selling his soul? The answer is a resounding yes. 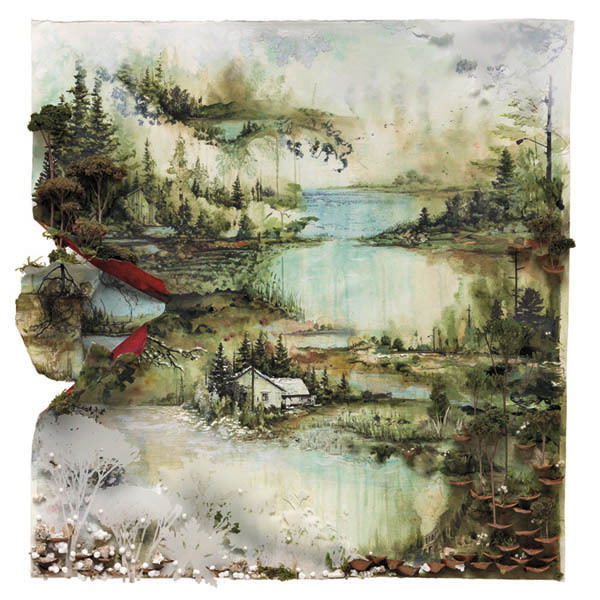 Bon Iver is a marvel. Vernon’s taken the ingredients that made For Emma transcend its bedroom folkie origins and fly – the hushed, multi-tracked falsetto vocals, the indelible melodies, the evocative, heartbroken lyrics – and expanded upon them. His voice is better than ever. His guitar playing soars. And he’s added keys and pedal steel and noise and double bass and and banjo – but all in the service of the songs. And that’s what distinguishes Justin Vernon from so many of the other Pitchfork favorites – unlike the Animal Collectives or the Fleet Foxes he has actual songs. You know, memorable, hummable tunes. Each of the ten tracks on Bon Iver represents a place – Perth, Calgary, Washington, Hinnom, TX, Lisbon, OH, etc – and they carry on Vernon’s tradition of oblique, poetic lyrics that lean toward the bucolic. Stories of travel and friendships and hurt and childhood are told amid a melange of references to forests and fields and lakes and roots. As well as a surprising number of Biblical allusions. It sounds like Vernon has been not listening to Kanye so much as Peter Gabriel (on “Calgary,” especially) and the Bee Gees. The record is full of the sort of synth pads and unusual rhythmic ideas of the former Genesis front man and has the high harmonies made famous by the disco band of brothers. He’s also borrowed some ideas from his soft-rock side project Gayngs, which resulted in the last song “Beth/Rest.” It’s perilously close to Level 42 or the Outfield or other 80s soft-and-easy favorites, but Vernon somehow manages to make it work. Forgotten how to write songs? Not quite. Bon Iver has a little more sheen to it than its predecessor. But have no fear.